Here are the best All-Inclusive Playa Del Carmen resorts: Ocean Riviera Paradise Daisy Family Club, Gran Porto Resort & Spa, Ocean Riviera Paradise El Beso, Grand Riviera Princess All Suites Resort & Spa, Secrets Capri Riviera Cancun, Grand Velas Riviera Maya, Sandos Playacar Beach Resort, Sandos Caracol Eco Resort and Spa, Blue Diamond Luxury Boutique Hotel, Occidental at Xcaret Destination. If you are searching for the best luxury all-inclusive Playa Del Carmen resort for families who want a plethora of amenities and activities onsite, then you need to stay at the Ocean Riviera Paradise Daisy Family Club. Located 10-minutes north of Playa Del Carmen, the Ocean Riviera Paradise Daisy Family Club has a great white sand beach and is one of four sections of the larger Ocean Riviera Paradise Resort. Ocean Riviera Paradise Daisy Family Club has a low rise Mediterranean architectural style that contains a variety of suites especially designed for families. Junior suites are spacious and are available in several categories from standard to swim-up to rooftop. Junior suites with a terrace as well as a Jacuzzi can also accommodate families. Master suites are larger with similar categories for families to enjoy. The Ocean Riviera Paradise Daisy Family Club has a superb white sand beach section for lounging, swimming and you have access to free non-motorized watersport equipment. Your family will thoroughly be amazed by the extra amenities to be found at the Ocean Riviera Paradise Daisy Family Club. Families will enjoy the dedicated entertainment staff that offers activities for the whole family from adults to children to teens. The Daisy Club is perfect for families with several unique amenities onsite like a bowling alley, water park, movie theater and video arcade. There are five freshwater swimming pools including a children’s pool and water park with slides. The Ocean Riviera Paradise Daisy Family Club all-inclusive Playa Del Carmen resort also has tennis courts, playground, fitness center, disco, dive shop, casino and a full service spa. The Ocean Riviera Paradise Daisy Family Club features a wonderful children’s buffet area and the adults will be pleased with the international cuisine. There are 10 restaurants onsite with cuisine that ranges from Asian to Italian to Mexican to seafood to grilled steaks. Nightlife is excellent with choreographed shows, movie theater, a casino for the adults, mini-disco for children and live music. When you are searching for that perfect all-inclusive Playa Del Carmen resort for your family, then you should try the Gran Porto Resort and Spa. Located directly in Playa Del Carmen and just one block off the famous La Quinta Avenida, the Gran Porto Resort and Spa has a white sand beach front and plenty of onsite amenities. The Gran Porto Resort and Spa has a wonderful three-story Mexican hacienda architectural style that house 287 rooms and suites that are furnished with hand carved furniture and Mexican décor. Standard rooms are spacious with a variety of bedding choices and a shared terrace with resort views. Junior suites are larger with a private terrace and ocean views. Master suites are one-bedroom with a separate living room and a view of the ocean from your bedroom as well as private terrace. The white sand beach area at Gran Porto Resort and Spa has nice swimming as well as waiter service while you relax in a lounger and European style sunbathing is allowed. You can arrange your favorite watersport activity at the dive shop and you can use the complimentary non-motorized watersport equipment. There is a fulltime entertainment staff that has events scheduled throughout the day for adults and the kid’s club is a favorite with families looking for organized activities for the children. Shopping is great along La Quinta Avenida and you will find a plethora of upscale store from H&M to Victoria Secrets to Bed Bath and Beyond to Guess to Nike. The Gran Porto Resort and Spa has a large freshwater swimming pool as well as a tranquil pool located on the third floor that has a swim-up bar. The property has a fitness center, kid’s club, dive shop and a full service spa. Dining at the Gran Porto Resort and Spa all-inclusive Playa Del Carmen resort includes buffet-style and ala carte selections at Albatros for all three meals as well as Gaviotas serves midday snacks near the beach and pool areas. In the evening Il Pescatore prepares innovative Italian cuisine as well as Maria’s which serves Mexican dishes. The Health and Sushi Bar is ideal for morning and afternoon snacks. Off-property choices are numerous with La Quinta Avenida one-block away and standout restaurants include Spice for Latin cuisine, Imprevist for international fare and Oh Lala! features Mediterranean dishes. Nightlife is limited onsite with live music and karaoke nights but offsite you can find Coco Bongo, Blue Parrot and La Vaquita all within walking distance. The Ocean Riviera Paradise El Beso is one of the newest adults-only all-inclusive Playa Del Carmen resorts and has superb first class amenities throughout the property. Located 10-minutes north of Playa Del Carmen, the Ocean Riviera Paradise El Beso is the adults-only section of this property which is situated on a white sand beach. The Ocean Riviera Paradise El Beso has a low rise Mexican architectural style with 192 junior suites that have a chic modern décor. There are three suite styles to choose from that include a junior suite, swim-up junior suite and rooftop junior suite. Each junior suite has a private balcony with views of the Caribbean Sea, pool or tropical landscape. The beach area at the Ocean Riviera Paradise El Beso is a great area for adults with European style sunbathing available and the swimming is excellent. You can use the complimentary non-motorized watersport equipment as well as arrange your favorite water adventure at the onsite dive shop. There is a dedicated entertainment staff that keeps fun events hopping throughout the day around the resort. The Ocean Riviera Paradise El Beso all-inclusive Playa Del Carmen resort has an adults-only freshwater swimming pool with swim-up bar and there are four other pools onsite. 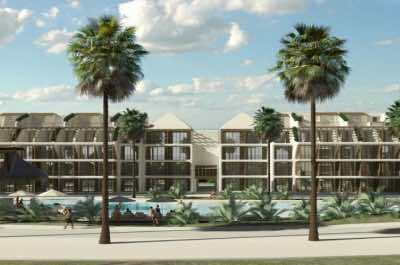 You will also be thrilled with the additional onsite amenities that include a bowling alley, theater, disco, dive shop, fitness center, tennis courts and a full service spa. Dining includes numerous options like Bluemoon which is exclusive to El Beso guests. You can also indulge in cuisine at nine other restaurants that serve innovative Asian, Italian, Mexican, Caribbean and seafood dishes. Nightlife includes a quiet drink at one of the nine bars, choreographed shows in the theater, dancing at the disco, maybe bowling and there is a casino with Las Vegas style gaming. The Grand Riviera Princess All Suites Resort and Spa is one of the best all-inclusive Playa Del Carmen resorts for couples and families who are searching for plenty of onsite amenities. Located just north and 15-minutes from Playa Del Carmen, the Grand Riviera Princess is situated on a spectacular stretch of white sand beach within a wonderful jungle atmosphere. The Grand Riviera Princess has an excellent Spanish hacienda design with 674 rooms and suites which feature a sleek contemporary décor. Junior suites are spacious with private balcony as well as views of the gardens and junior deluxe suites include a Jacuzzi. Junior deluxe swim-out suites have direct pool access from your patio. The Family Club deluxe junior room has three additional bunk beds, Jacuzzi and exclusive amenities for families as well as children. There is also a Family Club deluxe swim-out junior room with direct pool access from your patio. Platinum suites boast superior amenities such as private lounge, exclusive meals, private beach with butler service and an exclusive pool. Platinum and Laguna suites all are ocean front with spectacular views of the Caribbean Sea. Master suites share the same upgraded amenities and are a large one-bedroom suite with a separate living room. The Grand Riviera Princess has a splendid white sand beach with palapas for shade and swimming is good. You can use the complimentary non-motorized watersport equipment as well as arrange for your favorite watersport activity at the onsite dive center. There is a plethora of activities provided throughout the day by a dedicated entertainment staff. The kid’s club is fabulous and there is also teen’s club to keep all ages busy day as well as into the evening. 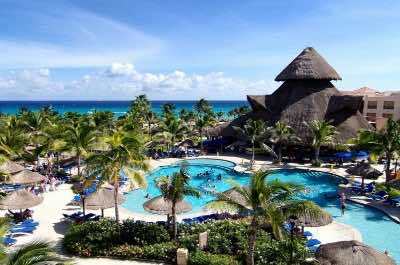 The Grand Riviera Princess all-inclusive Playa Del Carmen resort has sixteen freshwater swimming pools including an exclusive pool for Family Club members as well as for Platinum members. Many of the pools have swim-up bars and there are four dedicated for children. The resort facilities include a fitness center, tennis courts, dive shop, shopping, kid’s club, game room, night club, movie theater and a full service spa. The Grand Riviera Princess has two buffet style restaurants that serve all three meals and over 7 ala carte choices throughout the day and night. Ala carte options include La Vaqueria for grilled delights, Mama Mia serves Italian, La Hacienda prepares Mexican dishes, La fondue features Swiss fondue, Miso has Asian cuisine, Le Fleur prepares international gourmet dishes and Las Olas serves seafood creations. Nightlife is abundant with a night club for dancing, 24-hour sports bar, choreographed shows in the main theater, live music at the lobby bar and movies. Secrets Capri Riviera Cancun is a secluded all-inclusive Playa Del Carmen resort that caters specifically to adults and has a plethora of onsite amenities. Located 15-minutes north of Playa Del Carmen, Secrets Capri Riviera Cancun is situated on 71-acres of lush tropical landscape along a perfect white sand beach. Secrets Capri Riviera Cancun has a cluster of low rise Mediterranean styled buildings that contain 291 rooms as well as suites with a luxury upscale décor. Each room and suite includes Preferred Club member status which includes upgraded amenities throughout the resort as well as inside your respective accommodations. Deluxe rooms are 474 square feet with a private balcony and view of the gardens or ocean. Junior suites are 570 square feet with an integrated living area and private balcony that offers a view of the gardens or ocean. Ocean front junior suites are larger at 679 square feet with direct beach access from your patio. Honeymoon suites are over 1,000 square feet with a big integrated living room with a Jacuzzi and balcony that features a garden or ocean view. The one-bedroom presidential suite has 1,582 square feet with a kitchenette and a prime oceanfront view from a private balcony. Secrets Capri Riviera Cancun has a stellar white sand beach for swimming, relaxing and you can use the free non-watersport equipment as well as make arrangements for your favorite watersport adventure at the onsite dive shop. There is a fulltime entertainment staff which keeps the activities going throughout the day all around the resort. 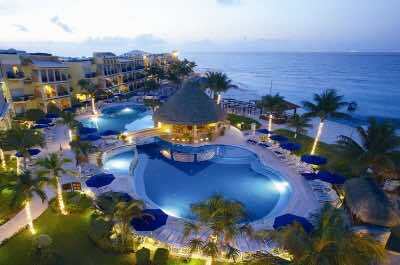 Secrets Capri Riviera Cancun all-inclusive Playa Del Carmen resort has a huge freshwater swimming pool with a swim-up bar and wonderful sundeck. 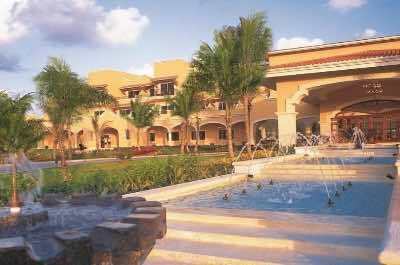 An added bonus is that green fees are waived at the nearby Grand Coral Riviera Maya Golf Course. The property has a fitness center, tennis courts, dive shop, music lounge, shopping and a full service spa. Dining is superb with La Riviera serving an international buffet for all three meals and five other ala carte choices during the evening. The Cactus Club boasts tacos and ceviche throughout the day. You can indulge in grilled steaks at Seaside Grill, Italian at Portofino, Oceana serves seafood dishes and Himitsu has hibachi delicacies. Nightlife includes choreographed shows in the main theater, movies on the beach, Desires Music Lounge, karaoke and piano music at the lobby bar. The Grand Velas Riviera Maya is one of the best luxury all-inclusive Playa Del Carmen resorts for adults and for families. Located just 10-minutes away from downtown Playa Del Carmen along the Caribbean Sea, the Grand Velas Riviera Maya is situated on 80-acres of mangrove forest and lush tropical landscape. 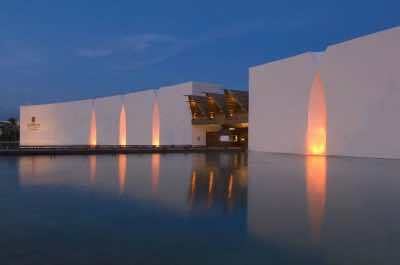 The Grand Velas Riviera Maya has a spectacular modern architectural design which is slanted in the front like a pyramid. There are 539 suites available in three distinct styles with sub-categories that offer either a jungle or ocean view from a private balcony. Grand class suites have one-bedroom as well as separate living room and range in size from the queen or king with 1,377 square feet with a private plunge pool to the presidential with over 2,700 square feet that contains two-bedrooms, a private pool and is complete with butler service. Ambassador suites are 1,270 square feet with either a king or double queen and a private plunge pool with views of the ocean. The Governor and presidential suites offer butler service, private plunge pool and either one or two-bedrooms of sleeping space. The Zen Grand king and queen are 1,184 square feet with a private terrace overlooking the jungle scenery. The Zen Grand Pool suite has either a king or two queen beds with a private plunge and views of the jungle. The Zen Grand presidential has two-bedrooms and two bathrooms with butler service. The Grand Velas Riviera Maya is loading with activities for adults-only as well as for families and the stretch of white sand beach is fabulous for swimming. You can use the free non-watersport equipment as well as arrange your favorite watersport adventure at the onsite dive shop. The Grand Velas Riviera Maya all-inclusive Playa Del Carmen resort has a wide selection of activities as well as a dedicated entertainment staff. There are two separate kid’s club as well as teen club’s which are at the Zen complex and the other within the Ambassador section. The property has three freshwater swimming which are located within each complex and they all have a swim-up bar. 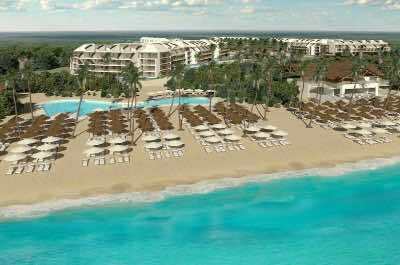 The resort contains a fitness center, night club, kid’s club, children’s pool, a dive shop and full service spa. Dining at the Grand Velas Riviera Maya is nothing but ala carte and you will find several selections for all meals. The Bistro, Azul and Chaka are open for all three meals as well as four other choices for dinner which include standouts like Piaf for superb French cuisine and Cocina De Autor serves gourmet fusion dishes. Nightlife includes a sports bar, karaoke, movies, night club as well as a relaxing libation beachside. If you want an all-inclusive Playa Del Carmen resort that caters to all types from families to adults-only, then the Sandos Playacar Beach Resort is great choice for you. 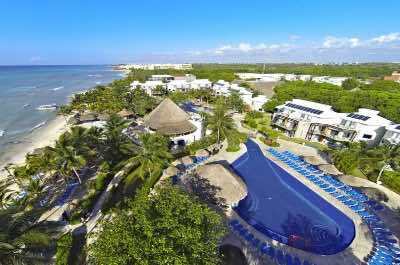 Located just south of Playacar and within walking distance to Playa Del Carmen, the Sandos Playacar Beach Resort is situated 25-acres along a 3-mile stretch of white sand beach. The Sandos Playacar Beach Resort is composed of low rise colonial styled buildings in four distinct categories that include the beach section, select club adults-only, family section and royal elite haciendas. The beach section offers standard sized rooms with a private balcony and views of the garden or pool. Superior ocean front rooms are geared towards adults-only and you will receive upgraded amenities like a private pool, exclusive beach section and private restaurant. Select club adults-only section has Riviera junior suites and one-bedroom master suites that are furnished with a private balcony with views of the garden, pool or jungle. The family section features Riviera junior suites with an integrated living area, Jacuzzi and private balcony with views of the jungle, pool or gardens. Royal elite haciendas have junior suites with a wading pool, Jacuzzi, an integrated living area and balcony with views of the jungle. There are also one-bedroom villas that contain a solarium, private pool and Jacuzzi. 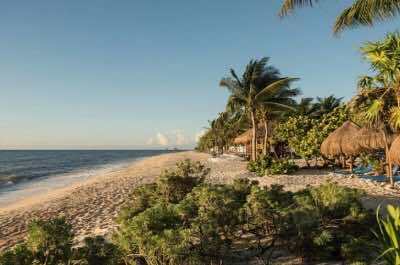 The Sandos Playacar Beach Resort has one of the longest stretches of white sand at 3-miles and offers a plethora of activities including a private section for adults over 21 years of age. You have access to complimentary non-motorized watersport equipment as well as an onsite dive shop to help arrange other watersport adventures. There is a dedicated entertainment staff which offers organized activities throughout the resort. The kid’s club is great and accommodates babies as well as teens with a variety of events. 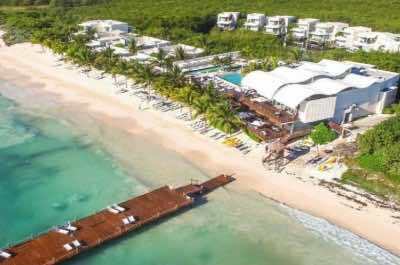 The Sandos Playacar Beach all-inclusive Playa Del Carmen resort has nine freshwater swimming pools with individual features like sunning islands and the adults-only pool has a swim-up bar as well as cabana beds. The grounds are superb with manicured garden areas and jungle sections where animals roam freely and howler monkeys are seen frequently. The property contains a fitness center, tennis courts, night club, arcade room, mini-golf course, movie room, nature trails, free bike rentals and a full service spa. Dining at Sandos Playacar Beach Resort includes three buffet restaurants with the Grand International Buffet open for all three meals, Iztapalapa for breakfast and lunch and Select club is open only for breakfast. There are eight ala carte establishments in the evening serving Asian, Casual Beach fare, Mediterranean and grilled meats. Standouts are Fogo De Janeiro for Brazilian Rodizio and Il Piemonte serves Italian. Nightlife consists of a night club for dancing, sports bar, choreographed shows, movies and beach theme parties. If you are searching for an once-in-a-lifetime experience in an all-inclusive Playa Del Carmen resort, whether you are looking for an adults-only or family friendly environment the Sandos Caracol Eco Resort and Spa is the perfect fit for both. Located in the northern section of Playa Del Carmen, the Sandos Caracol Eco Resort and Spa is situated in the perfect Riviera Maya setting with sprawling jungle, a cenote for snorkeling and rich Maya culture throughout the grounds. The Sandos Caracol Eco Resort and Spa is a collection of low rise buildings which have a modern architectural design that is separated into an adults-only and family friendly section with several levels of upgrades available. There are 738 rooms and suites that have a modern décor with sufficient ascents to please the senses. All rooms and suites have a private balcony with views of the garden, pool or jungle. Standard Family rooms are normal hotel room sized and deluxe with Jacuzzi are slightly larger with a sofa bed, an in-room Jacuzzi. Junior suites have an integrated living area with sofa bed and Jacuzzi. Signature Eco Superior rooms has a jungle décor and Signature Eco Junior Suites are a favorite with families because of bunk beds, two showers as well as a private plunge pool. Select Club Adults Only rooms are available in a Superior model which is close to the pool and the Deluxe which features an in-room Jacuzzi as well as upgraded amenities like a private pool and beach section. Royal Elite guests can choose from a superior or a one-bedroom suite and these units offer upgraded room and resort amenities. The Sandos Caracol Eco Resort and Spa has a fabulous white sand beach front for you to enjoy swimming, relaxing and your favorite watersport activity. The resort overall is a crowd pleaser with numerous attractions such as an aqua park with numerous waterslides, nature trails, a cenote onsite for snorkeling, animals roam the property freely and you can experience a guided rowboat river cruise. The Sandos Caracol Eco Resort and Spa all-inclusive Playa Del Carmen resort has a dedicated entertainment staff that features events for adults and at the kid’s club which is fabulous for families. There are two fresh water swimming pools with one equipped with a swim-up bar. There is a dive shop, shopping, fitness center, full service spa, aqua park, tennis courts, night club and movie screening room onsite. The Sandos Caracol Eco Resort and Spa has three buffet restaurants with two being open at for all meals. There are six ala carte restaurants open in the evening serving cuisine from Brazil, Asia, Italy, Mediterranean and Vegetarian as well as seafood. Nightlife includes choreographed shows, movies, a night club for dancing and themed parties on the beach. When you are looking for a unique adults-only boutique all-inclusive Playa Del Carmen resort that is intimate with superior amenities, then the Blue Diamond Luxury Boutique Hotel is an ideal selection. Located 10-minutes north of Playa Del Carmen along a beautiful stretch of white sands, the Blue Diamond Luxury Boutique Hotel is situated on 36-acres of tropical landscape that includes a natural waterway and a cenote. The Blue Diamond Luxury Boutique Hotel has several one and two-story villas with a modern architectural design that contains 128 luxury suites which feature a sleek trendy décor. Patio junior suites are large with an open floorplan, an outdoor soaking tub and a view of the river from your private terrace. Cenote/Lagoon junior suite has fabulous floor to ceiling windows, private terrace with view of the cenote or lagoon and an additional outdoor bathroom. The Palafitos junior suites have an outdoor soaking tub, rooftop terrace with view of the ocean and views of the river from your suite. Patio suites have a separate living room, private pool with garden and views of the river from a private terrace. Beach Front Casitas have a rooftop pool with views of the sea and direct beach access from your ground floor terrace. The Blue Diamond Luxury Boutique Hotel all-inclusive Playa Del Carmen resort has a nice stretch of white sand that allows for good swimming and you have access to an assortment of non-motorized watersport equipment. There are organized yoga and cooking classes as well as nature hikes on throughout the property. You have access to an 18-hole championship golf course and a dive shop that offers one snorkeling or scuba diving trip per stay. There are three freshwater swimming pools with two overlooking the Caribbean Sea. Other facilities onsite include a fitness center, full service spa and dive shop. The Blue Diamond Luxury Boutique Hotel has two restaurants onsite that serve a variety of gourmet cuisine for all three meals from casual to fine dining. Nightlife includes live music, a rooftop cigar bar and you are within an easy taxi ride to Playa Del Carmen where you can dance all night at the Blue Parrot. If you are looking for an upper-mid-range priced all-inclusive Playa Del Carmen resort which is family friendly and next to one of the most popular attractions in the Riviera Maya, then the Barcelo Occidental at Xcaret Destination is an optimum choice for you. Located 10-minutes from Playa Del Carmen, the Barcelo Occidental at Xcaret Destination is situated on 25-acres of lush tropical landscape and boasts direct access to the eco-archaeological theme park of Xcaret. The Barcelo Occidental at Xcaret Destination is a combination of several low and high rise buildings that have a tropical design and house 789 rooms as well as suites which boast a contemporary décor with Mexican ascents. There are two levels of service and amenities associated with the rooms at the Barcelo Occidental at Xcaret Destination which are deluxe and royal club level which offers a private lounge, an exclusive ala carte restaurant and private pool area with waiter service. All rooms have a balcony with views of the garden or special resort features such as the meandering river or Mayan ruins. Deluxe rooms as well as Deluxe Concierge rooms with upgraded in-room amenities have 344 square feet and a variety of bedding choices. Junior suites are spacious at 504 square feet with a separated sitting area. The Deluxe Romance rooms are specially designed for romance and offer amenities like breakfast in bed as well as upgraded in-room amenities. Royal Level Luxury rooms have 431 square feet of living space with superior in-room amenities. Royal Level Junior Suites are massive at over 900 square feet with a separated living room area. Royal Level Master Suites have 1,270 square feet with two-bedrooms, two bathrooms and plenty of space in the living room. 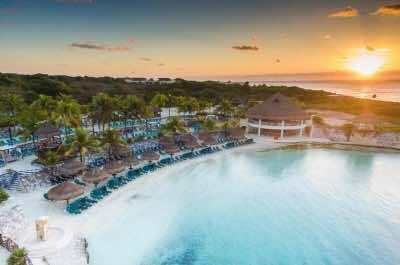 The Barcelo Occidental at Xcaret Destination all-inclusive Playa Del Carmen resort is ideal for families who want plenty of activities onsite to keep everyone happy. You will enjoy a white sand beach which is situated in a cove which provides for excellent swimming and snorkeling. There are palapas for shade, a dive shop to arrange all your watersport adventures as well as food and drink service. One of the more exciting options at the Barcelo Occidental at Xcaret Destination is the option to upgrade to the Unlimited Xcaret Experience package which affords unlimited access to 40 cultural attractions at Xcaret the eco-archeological theme park. The resort has plenty of amenities like an entertainment staff that keeps the resort lively throughout the day. The kid’s club is great with organized events for children and there are lots of added perks like a mini-golf course and a meandering river runs through the resort grounds. The property has 4 freshwater swimming pools as well as one saltwater pool. There is one swim-up bar and a separate children’s pool. Other facilities onsite include a dive shop, archery range, tennis courts, fitness center, mini-golf course, kid’s club and a full service spa. The Barcelo Occidental at Xcaret Destination has 11 restaurants which include two buffet locations serving all three meals and two night-time snack bars. Five ala carte restaurants in the evening feature Mexican dishes at La Hacienda, Los Olivos has Italian, D’Oriental serves Asian delights, El Pescador prepares seafood and Sonora Grill features grilled meats. Nightlife at Occidental at Xcaret Destination Playa Del Carmen resort includes choreographed shows in the main theater, dancing at Palenque Night Club and live music in the lobby bar as well as a sports bar.